Up for grabs today is a Trio Colour Kit for 1 lucky winner thanks to Mavala. 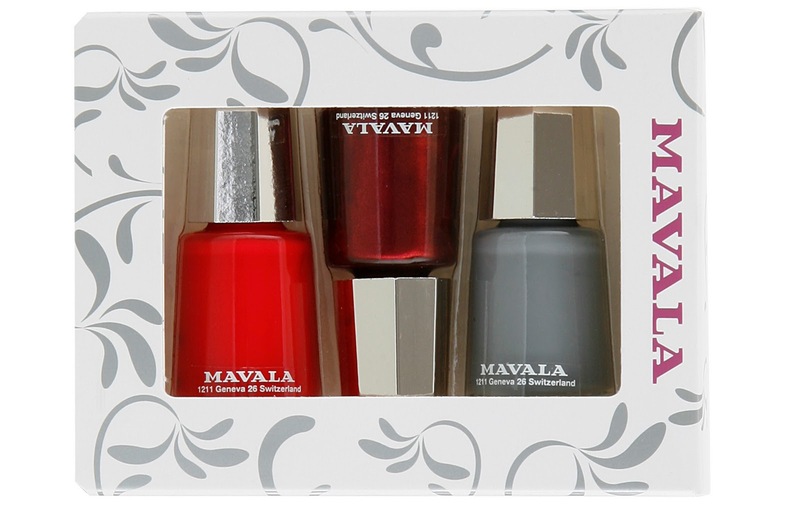 Mavala is the world leader in nail care with a heritage spanning over 50 years. Created in 1958 by MAdelaine VAn LAndeghem and with the introduction of Scientifique Nail Hardener which remains one of their best selling products to date, Mavala is available globally in over 100 countries, with stockist ranging from small independent salons to large department stores. Mavala specialise in the maintenance of beautiful looking nails and offers a complete range of products to alleviate all nail concerns, from uneven nail surfaces, splitting and flaking due to lack of hydration or nail discolouration, there is sure to be a Mavala nail care solution to suit you. Mavala also offers a vast array of over 150 nail colours in shades ranging from chic yet understated nudes to the bold and vibrant. The Mavala Eye-Lite range was introduced in 1967 with Double-Lash; a unique eyelash enhancer formulated to lengthen, cover and protect the lashes allowing them to become healthy, long and resistant. Today, the Eye-Lite range consists of an assortment of products from eye make-up removers, nourishing moisturizers specifically formulated for the delicate eye area to a selection of high quality make-up products. In natural line with nail care and beauty, MAVALA offers a range of products specifically formulated to care for the hands all which are based on active ingredients revolutionary in their use in hand treatments. After many years of research and development, Mavala introduced its line of face care and beauty: Mavalia - the Blending of Science (Mavala) and Nature (Mallow) - a natural key ingredient that is present in all products within the Mavalia skincare range. You can also choose from a selection of impeccable make-up products from the Mavalia range; including long-lasting wear foundation, complexion enhancing blush and easy-glide lipsticks in a variety of shades. Because we feel it's important to give your feet the same attention given to hands, Mavala also offers a range of effective complimentary foot care products to keep your feet feeling and looking their best. You can get all the latest news on Mavala products by following them on Facebook and/or Twitter. You can see full details of all of their products on their website - www.mavala.co.uk. Looks perfect for an after Christmas treat. Ooops please delete previous comment: Mavala double lash. hope I win this gorgeous set. Fingers crossed. oops! didn't read the question. the answer is : double lash.